It is good to look back at the 1980 recession and analyze what happened. First, the recession officially started in July of 1980. Be that as it may, the business cycle had already topped off in the 3rd quarter of 1978 when the economy hit the effective demand limit. Capacity utilization started falling the same time the effective demand limit was hit, 3rd quarter 1978. From there it was falling all the way to July of 1980. Unemployment started rising 2nd quarter 1979, more than a year before the start of the recession. Real GDP rose very slowly from 4th quarter 1978 thru 2nd quarter 1979. Using a model for Aggregate supply & Effective Demand (AS-ED), instead of the commonly known Aggregate supply & Aggregate demand (AS-AD) model, I will show what happened from 1978 to 1980. The blue dots along the bottom are real GDP on the aggregate supply curves increasing at an inflation rate around 2%. Real GDP will most likely continue this path over the next year, shown by lower dashed black line. The dashed black line above shows the effective demand limit coming steadily downward toward the LRAS zone. (LRAS is long-run aggregate supply). Real GDP and effective demand will meet at the LRAS zone. What will happen when they meet? Well, let’s now go back to 1980 and see what happened back then. I am not saying that it will happen exactly the same way now, but let’s just see what happened back then. 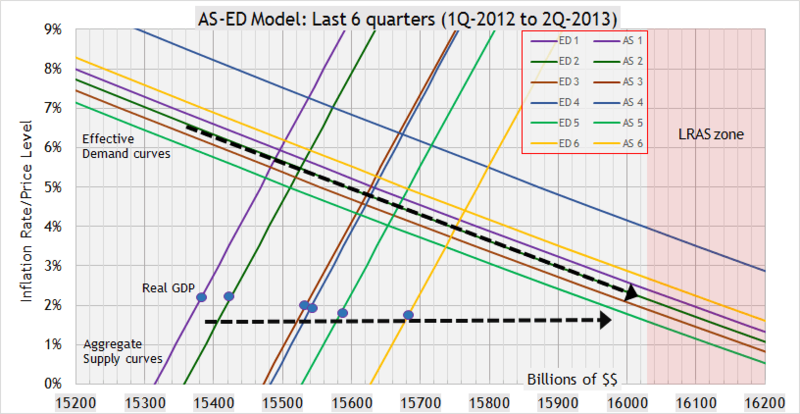 Here is a graph where the red dots are real GDP on the aggregate supply curves. Look at the dashed black lines in the lower left of graph #2. Real GDP was came in horizontally leading up to the 3rd quarter of 1978. The green dots are the first two quarters of 1978. The first red dot is the 3rd quarter of 1978. Now look at the dashed black line coming down. Before the 3rd quarter of 1978, effective demand had been tracking along that black dashed line since the 3rd quarter of 1975. Effective demand had been tracking steadily downward for 3 years toward the meeting place with real GDP. The same has been happening now since the end of 2010. In graph #2, the first red dot is on the crossing point of two solid black lines. One solid black line is the aggregate supply curve for 3rd quarter 1978. The other solid black line is the effective demand curve for 3rd quarter 1978. When real GDP sits at the crossing point of effective demand and aggregate supply, the economy reaches the LRAS zone. The LRAS zone is more a zone than a vertical curve in the way the economy moves into it. Theory says that at the LRAS curve, inflation will start to develop and real growth will slow down. We see exactly that happen in the graph above, but in a zone and not directly on a vertical curve. 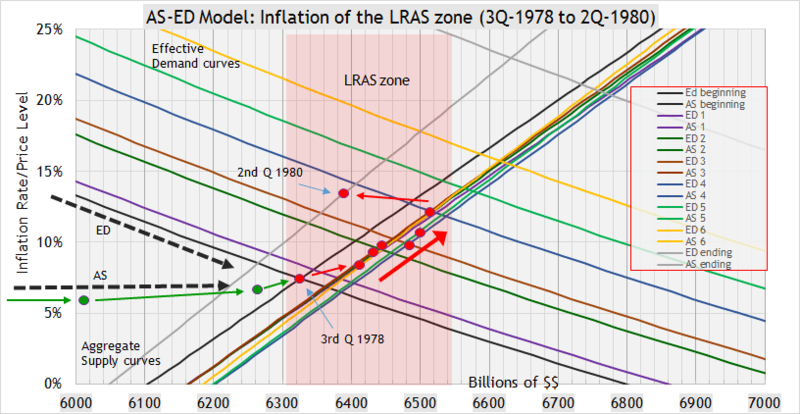 The LRAS zone is marked by crossing lines of the same color before the recession started 2nd quarter 1980. As the red dots of real GDP progress into the red area of the LRAS zone, we see inflation start to develop and real GDP growth slow down. Inflation had been tracking between 6% and 7% since 4th quarter 1975. Real GDP was moving horizontally between 6% and 7% inflation. In the LRAS zone marked by the effective demand limit, inflation rose from 6% to eventually 12% right before the fall in real GDP. Real GDP stagnated through the LRAS zone during 1979. So there was a cost-push inflation spiral taking place in 1979 within the LRAS zone. What was the solution? The Federal Reserve came to action. The Fed rate was elevated to 10% during the 3rd quarter of 1978. Then it stayed there for a number of quarters but it was not high enough to suppress the cost-push inflation spiral. As inflation developed after that in 1979 within the LRAS zone, the Federal Reserve raised the Fed rate to over 13% by the start of the recession. Eventually the Fed rate cut the inflation spiral in the LRAS curve. and the dynamics of that spiral had to wind back down… as it wound down the recession started. In graph #1, we see the same scenario happening again as it was playing out before 1978; Real GDP moving horizontally and effective demand heading downward straight to the point of contact. If real GDP keeps growing at around $100 billion per quarter as it did in 2nd quarter 2013, real GDP will enter the LRAS zone in mid 2014. If the same scenario plays out, inflation will start to develop next year, but with sluggish real growth after. What is different now? Well, capacity utilization has backed down below 78% which is similar to what happened in 1978. Yet, unemployment is falling, instead of rising. I still think unemployment has a bit to fall before real GDP reaches the effective demand limit next year. But it will be interesting to see the speed with which the economy enters the LRAS zone. capacity u is about ready to surge. I’d sure like to know what makes you think so. TCU has been static at the recovery high for two years. Note the almost perfectly linear steady decline in highs for 4 decades. TCU has never made an advance after topping. This is the worst recovery ever, and it’s losing steam. And the Fed is going to taper. I see no reason for optimism. It would seem that capacity utilization is going to surge, but it is very common to have real GDP growth before a recession starts with a stagnating or falling capacity utilization. I’d still like to see some rationale for a cap ut surge.